This section describes how to customize project preset settings to create a project. This procedure does not change the original project preset. To create project presets or change project presets, perform through [Application] in [System Settings] → [Project Preset]. 1) Enter a project file name in [Project name] of [Project file] in the [Project Settings] (Simple Settings) dialog box. 2) Select a project preset. 3) Check [Customize], and click [OK]. The [Project Settings] (Detailed Settings) dialog box appears. 4) Configure a project, and click [OK]. Display a list of commonly used video formats. From this list, select a video format that suits the export environment. Display a list of commonly used audio formats. From this list, select an audio format that suits the export environment. Click this button for detailed settings. Click the expand button to customize detailed settings based on the format selected in [Video Preset] and [Audio Preset]. You cannot change the items displayed in gray. Select a frame size from the list. Select an aspect ratio from the list. Select a frame rate from the list. For interlace, a field order can be selected. Select the channel to be exported (color channel/alpha channel) from the list. Select [YCbCr] to export only color channel. Select [YCbCr + Alpha] to export both color channel and alpha channel. Select a video quantization bitrate from the list. This setting is only available for a frame rate of 24p or 23.98p. Select a convert format to convert a 23.98p video to a 59.94i or 59.94p video signal. [Pulldown(2-3-2-3)] enables a smooth playback, but is not appropriate for re-editing. Select this item for the final export. [Advanced pulldown(2-3-3-2)] does not provide a smooth playback. Select this item to create a temporary file to edit. Select the color space of the project. For 3D editing, select [Enable]. The stereoscopic edit mode is set. Select an audio sampling rate from the list. Select the number of audio channels from the list. Select an audio quantization bitrate from the list. Select the default codec to be used for rendering and file export during editing. RGB, UYVY, YUY2, RGBA and v210 are uncompressed AVI. For some codec, the rendering quality can be configured by clicking [Detail]. Enter the ratio when you use overscan. The value range is between “0” and “20”. If you do not use overscan, enter “0”. Set the audio reference level. If you switch the display of the [Audio Mixer] dialog box to a VU meter, a scale with the specified audio reference level at “0” is displayed. Select a resampling method when transforming video with the layouter. Default settings for creating a sequence. Enter the start timecode of the timeline. When NTSC has been selected for the project setting, select either drop frame or non drop frame timecode display. Set the length of the timeline by entering a number when the final total length is fixed. When the project exceeds this length, the color of the timeline section that is over the limit change. Default settings of a number of tracks and a channel map for creating new projects or sequence. Set the number of tracks in which you place clips. You can add or delete any tracks after opening a project. In the [Audio Channel Map] dialog box, configure the audio output channel of each track. Formats that can be exported with alpha channel retained when [Video Channel] is set to [YCbCr + Alpha] are Grass Valley HQ AVI, Grass Valley HQ QuickTime, Grass Valley HQX AVI, Grass Valley HQX QuickTime, and uncompressed (RGBA) AVI. To create a project in a format with resolution of other than 4K or video format (such as resolution for square shape), select the following codec for [Render format] in [Setup]. If a correct rendering format is not selected for the project settings, the item in [Render format] is displayed in red and the setting cannot be completed. You can configure the rendering quality for each codec in the [Project Settings] (Detailed Settings) dialog box. For the details of the items, see the [Settings - Grass Valley HQ]/[Settings - Grass Valley HQX] dialog box of [Preset Wizard], by clicking [Hardware] in [System Settings] → [Device Preset]. Click [Save as default] to save the current settings as defaults. Check this item to export a clip of a raw source without re-encoding. Output speed is fast. Select quality from the list. The higher the quality, the more time it takes to be encoded. [CBR] sets a fixed transfer rate, allocating a fixed number of bits during the encoding process. Select a bitrate from the [Average(bps)] list. You can also enter a value directly. [VBR] sets a variable transfer rate, altering the number of assigned bits according to the complexity of the movement or image quality. Compared with [CBR], the media volume can be used more efficiently, and this enables more consistent image quality overall. Select a bitrate from the [Average(bps)] and [Maximum(bps)] lists. You can also enter a value directly. Select a YUV pixel format from the list. Select a profile & level. If [Chroma Format] is [4:2:0] and [4:2:2], the profile will be set to Main Profile and 422Profile, respectively. The level for SD image quality will be Main Level, and the level for HD image quality will be High Level. The profile & level changes according to the format selected in [Chroma Format]. For MPEG, a certain number of frames is considered as a group, and operations such as compression/enlargement and cut editing are performed on a GOP basis. A GOP comprises “I frame”, “P frame” and “B frame”. The I frame allows images to be reproduced independently, the P frame is for recording and reproducing only the differences with the preceding image, and the B frame reproduces images from the differences in the preceding and following images. Select I, P and B frame patterns of the GOP from the list. Normally, select [IBBP]. [I-Frame Only] is comprised of only I-pictures. Editing is made easier, but the amount of data increases in size. Set the number of frames included in a group. Check this item to complete information within each GOP. Although the amount of data increases, the video can be re-edited using software that supports GOP-based editing. Normally, leave this item unchecked. Select an item from the list for high-frequency compensation that saves while emphasizing the high range. [None] is a setting without high-frequency compensation. [50/15 us] is an emphasis setting employed by some audio CDs, etc. [CCITT J.17] is a telecommunications standard recommended by CCITT. The “protection_bit” indicates whether redundancy is added to an audio bit stream in order to make error detection and correction possible. Check this item to change it to “1”, indicating that redundancy is being added. Uncheck this item to change it to “0”, indicating that redundancy is not being added. Check this item to change the “original_copy” bit to “1”, indicating the original copy. If it is unchecked, it becomes “0”, indicating a duplication. Check this item to change the “copyright” bit to “1”, indicating that the copyright is protected. If it is unchecked, it becomes “0”, indicating there is no copyright. Items that can be configured are the same as [MPEG2 Program Stream]. Check this item to export a clip of a raw source without re-encoding. This increases the output speed. [CBR] sets a fixed transfer rate, allocating a fixed number of bits during the encoding process. Select a bitrate from the [Average] list. You can also enter a value directly. [VBR] sets a variable transfer rate, altering the number of assigned bits according to the complexity of the movement or image quality. Compared with [CBR], the media volume can be used more efficiently, and this enables more consistent image quality overall. Select a bitrate from the [Average] and [Max] lists. You can also enter a value directly. For MPEG, a certain number of frames is considered as a group, and operations such as compression/enlargement and cut editing are performed on a GOP basis. A GOP comprises “I frame”, “P frame” and “B frame”; the I frame allows images to be reproduced independently, the P frame is for recording and reproducing only the differences with the preceding image, and the B frame reproduces images from the differences in the preceding and following images. Select I, P and B frame patterns of the GOP from the list. Normally, select [IBBP]. Select a bitrate from the list. If the frame rate of the export format is 23.98p, segment encode is not available. Select the quality of the part to be re-encoded from the list. The higher the quality, the more time it takes to be encoded. Check [Use MSDV codec] to export the content to an MSDV codec AVI. Select the final output channel for the output from the track. 1) Click [Channel map] in the [Project Settings] (Detailed Settings) dialog box. The [Audio Channel Map] dialog box appears. 2) Click the point where the track and the channel to output intersect to configure the audio channel map. Every click switches between [Stereo], [Mono], and [No Output folder]. For stereo output, use a combination of an odd number channel and an even number channel and set this option to [Stereo]. If you output in monaural, select [Mono], and if you do not output anything, select [No Output folder]. If the setting is invalid, “-” is displayed. The number or type of track to be displayed differs depending on the [Track (Default)] settings in the project settings. The number of channels to be displayed differs depending on the [Audio Preset] or [Audio Channels] settings in the project settings. Select the output channel for the output from the track. Every click switches between [Stereo], [Mono], and [No Output folder]. Click this item to switch the display view of the [Audio Channel Map] dialog box. Register the settings as a preset. Use the track header to place an audio channel of the source clip to a desired track. To export a project with 8ch audio to Dolby Digital (AC-3), you can select the format for 5.1 channel. When you select formats for multiple channels to output as in the case mentioned, set the export destination of each track with the audio channel map in advance. If the export destination is not specified, the sound is muted. To play the sound in 5.1 channel surround, the sound is required to be created to be suitable for surround play. Note that the surround effect is not applied automatically only by setting the audio channel map and selecting 5.1 channel for the export format. You can register frequently used audio channel map settings as presets. 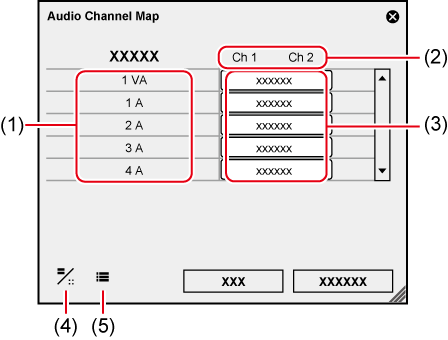 1) Configure the audio channel map in the [Audio Channel Map] dialog box. 2) Click [Preset], and click [Save]. 3) Enter a preset name, and click [OK]. You can overwrite an existing audio channel map preset with the current settings. In step 2) , click [Preset], and click [Update] → [Preset Name]. Confirm the preset name, and click [OK]. To display a list of the audio channel map presets, click [Preset] in the [Audio Channel Map] dialog box, and click [Properties]. Switch the audio channel map presets to use. 1) Click [Preset] in the [Audio Channel Map] dialog box, and click [Load]. A list of the audio channel map presets is displayed. 2) Select a preset, and click [OK]. You can delete audio channel map presets you created. 1) Click [Preset] in the [Audio Channel Map] dialog box, and click [Properties]. 2) Select a preset, and click [Delete]. Import an audio channel map preset. 3) Select a file, and click [Open]. Export an audio channel map preset you created. 2) Select a preset, and click [Export]. The [Save As] dialog box appears. 3) Set a file name and save destination, and click [Save]. Copyright © 2018 Grass Valley Canada. All rights reserved.